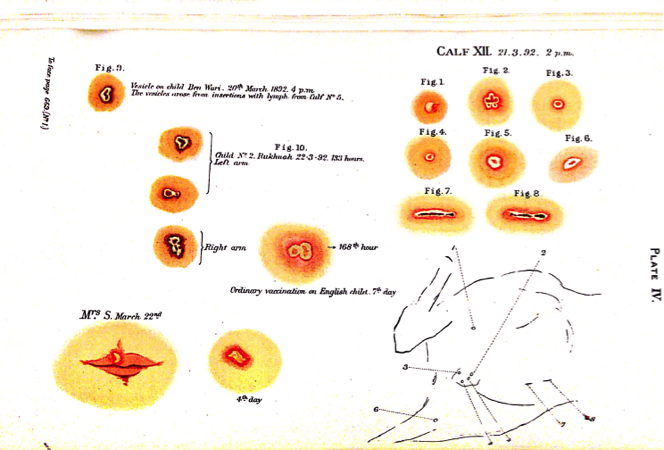 In his 1894 Reports on the Public Health in the British Cape Colony, Dr. Alfred Gregory spotted a frustrating problem with the colony’s supply of vaccine lymph: hot temperatures were killing the lymph’s cowpox viruses, rendering the lymph inert and unusable. Up to this year, Cape imported all its lymph from London-based pharmaceutical manufacturers. There were no local suppliers. Without lymph, imperial doctors had two options: either perform arm-to-arm vaccination and risk cross-infection with diseases like leprosy, or simply not vaccinate and open the door to smallpox epidemics. Today, we often think of hot climates as havens for bacterial and viral growth. Warm temperatures and even the human body serve as heated insulators for microbiological proliferation. However, late nineteenth-century British imperial doctors like Alfred Gregory witnessed a contrary process regarding vaccine lymph. Rather than encouraging lymph’s viral growth, heat was in fact killing the cowpox viruses. Between 1901 and 1903, the British government and its colonial administrations compiled a folio of correspondence centered on inert lymph in imperial settings and solutions to the issue. It especially addressed heat’s impact on lymph and how climate affected the medicine imperial doctors practiced. As vaccine lymph was crucial to smallpox prevention, imperial doctors needed to find a better way of addressing the issue of inert lymph. Warm temperatures rendered inert lymph exported from Britain’s vaccine manufacturers, thereby compelling imperial officials and doctors to consider establishing colony-based vaccine manufacturing institutions known as vaccine farms, leading to an independent imperial community with no need for imported British lymph. 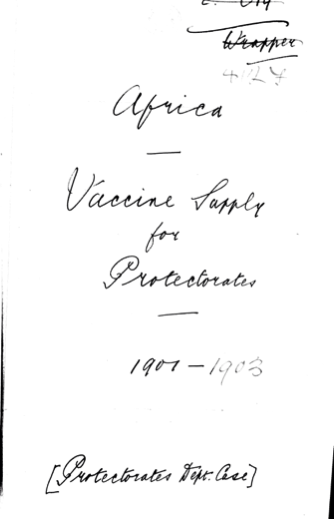 Title page to the folio on vaccine lymph investigations in British imperial Africa, 1901-1903. National Archives, Kew, FO 2/817. Generally speaking, it was difficult to avoid hot temperatures in nineteenth-century British colonies. India, much of imperial Africa, and the Caribbean were situated in warmer climates than Britain. Exceptions included New Zealand and Canada, but accessing either colony still meant sailing through warm temperatures. As such, heat formed an important part of the imperial consciousness, a distinct if unavoidable climatological issue to which European settlers had to adapt. British bookshops at home sometimes offered medical guides to travelers going abroad. These guides detailed colonial climates and how to deal with medical conditions in each. Charles Heaton’s Medical Hints for Hot Climates and for those out of professional aid (1897) stated that heat was a central concern for imperial travelers and settlers. Heaton‘s was a light but dense guidebook that stressed “portability.” Preparing imperial travelers and settlers for hot climates gave precedence to the idea of heat in the Empire as an inescapable fact, and one that required adaptation in almost all areas of life. 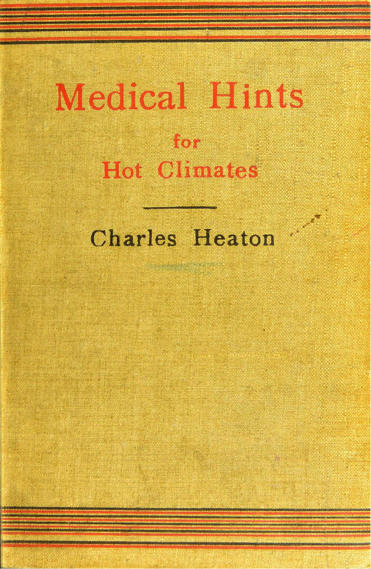 The cover to Charles Heaton’s Medical Hints for Hot Climates (1897). Even the colors used seem to evoke heat. Wellcome Library, London. Although settlers in their own right, imperial doctors experienced Empire’s climate with a professional urgency. Before departing Britain for colonial shores, especially towards the end of the nineteenth century, they read about warm climates through narratives in the British Medical Journal and the Lancet as well as in tracts like Andrew Davison’s Hygiene & diseases of warm climates (1893). Yet reading about a hot climate and actually practicing medicine in one required both personal and professional adaptation to warm environments. All of these diseases [i.e. leprosy, beriberi, malarial fever] are more or less unfamiliar to those educated at home, and most of them will probably be seen for the first time by the medical officer when he commences to practise in the tropics, and it may be safely said that they will form more than three-fourths of the cases he will be called upon to treat. Davison explicitly pointed out the differences faced by physicians in imperial environments from those in Britain. Many of those differences, he believed, originated purely from a warmer climate. In this way, heat became a creator of imperial medical practices, distinguishing imperial doctors from those in Britain based on the special training and skills they needed. Managing diseases in imperial settings involved public health practices. Many of these, such as malaria control, posed completely new challenges to colonial administrators. However, some practices were already used in Britain and were transferred to imperial environments, only to face a variety of cultural, social, and climatological barriers. Smallpox vaccination was one of these crucial transfers. Many indigenous cultures already practiced inoculation, yet British-trained doctors introduced vaccination, sometimes forcibly but more often flexibly, adapting to local customs and using community leaders to promote vaccination. By the 1890s, the British medical establishment had begun to move away from arm-to-arm vaccination and instead used strictly manufactured and regulated glycerinated calf lymph, otherwise known as pure vaccine lymph. Even though the Cape Colony established a vaccine farm at Grahamstown’s Bacteriological Laboratory in 1891, the colony continued to import the bulk of its lymph from British pharmaceutical manufacturers, such as the Society of Apothecaries, until the mid-1890s. The problem of inert lymph noticed by Alfred Gregory began to break down that relationship. In February 1893, district surgeons across the Cape’s rural districts collectively presented a list of grievances to the Colonial Secretary in Cape Town. Many of the complaints were about vaccination, particularly its high costs in buying supplies and the lack of government subsidies for those costs. Other complaints dealt with a lack of lymph supplies and the inability to administer vaccination with lymph. George Heberden, for example, related his experience: “I, at once…drew up a vaccination tour – in my case a fac simile of the previous year, and which failed entirely, owing to the bad quality of the lymph.” This caused the vaccinations to fail, and the Cape government turned to a “properly appointed medical officer” to do a better job. For imperial doctors, then, inert lymph constituted an issue of authority and professional competence, not just one of public health. In supposedly rendering lymph unusable, climate impacted the imperial doctor’s ability to perform vaccinations and undermined his ability to administer to his patients. Cape district surgeons were not the only imperial medical officers affected by inert lymph. Speaking in the Australian Parliament in 1887, a Mr. Gaunson reported Australian physician’s dealings with government-supplied vaccination, much of which proved inert. Gaunson quoted several doctors, including Dr. Hearn of Hamilton, who stated, “In my experience it has proved absolutely inert.” In Antigua in spring 1901, Dr. John Pierez complained, “The vaccine lymph now received is inert.” And in May 1901, the Governor of the Gambia in West Africa wrote to the Crown Agents in London on the situation in his colony: “Vaccine lymph sent by mail of the 3rd April appears to be useless.” He demanded a refund of some kind from the Jenner Institute, where the government had originally purchased the lymph. Plate IV from the Sixth Report of the Royal Commission on Vaccination, 1897. Growth of vaccine lymph on a child and on a heifer. Wellcome Library, London. Pressed by a short supply of lymph, medical officials had to explore the causes behind “inertness.” If lymph was functioning at the time it left London, at what point did it become unusable? Formerly it was the custom for the Government to import calf lymph from England, but for some reason which has never been satisfactorily explained, although generally believed to be connected with exposure to excessive temperature during transit and to the length of time during which it had necessarily to be kept, it was often inert when it came to be used. In regard to the bacterial behavior of lanoline and glycerine, respectively, when used as preservatives, I append (B) experiments by Dr. Srinivasa Rao, Bacteriologist to the Mysore Government, which conclusively rebut the attitude assumed by Drs. Copeman and Blaxall, as representatives of the policy of the Local Government Board of England. For this reason, larger colonial governments established vaccine farms in their territories to produce imperial lymph for immediate medical consumption within days of manufacture. By the late 1890s, India, Australia, and the Cape had founded individual, well-functioning vaccine farms for their medical communities. In 1903, the British East African Protectorate used experiences from India and the Cape to establish its own vaccine farm at Entebbe, Uganda. Yet these colonial vaccine farms did not only supply their home colonies. Rather, they supplied other British colonies, and even other European colonies, with vaccine lymph, emphasizing an imperial medical network moving away from a Britain-centric model, if one had even existed. As seen from vaccination, hot climates typical of many British colonies influenced the way in which imperial governments and medical communities approached public health in a non-British environment. When imported British lymph failed in hot temperatures, imperial governments established local vaccine farms and supplied colonies without vaccine farms with this lymph. As such, the narrative of British imperial vaccination policies extends far beyond the causal interaction of heat and lymph; yet without lymph, those narratives would not exist. And, as we move into a future of diseases requiring concerted public vaccination efforts, preservation of the pharmacological material needed for successful vaccinations becomes an even more imperative question, particularly in places lacking the technology to properly preserve public health tools. Kristin Brig is a PhD student in the history of medicine at Johns Hopkins University, and received her BA and MA in history from the College of Charleston. She currently examines how nineteenth-century indigenous and laborer communities in imperial Africa used and transformed British public health tools and efforts to fit local needs. In 1796, Edward Jenner published his discovery concerning how cowpox, or “vaccine,” could prevent someone from catching smallpox. This discovery eventually eclipsed inoculation, or inoculating with smallpox, as cowpox proved safer than smallpox for patients. Charles Heaton, Medical Hints for Hot Climates and for those out of reach of professional aid (London: W. Thacker & Co., 1897), preface. These areas included dress, personal medicines, and alcohol intake. Andrew Davison, Hygiene & diseases of warm climates (Edinburgh: Young J. Pentland, 1893). For one such examination, see Rohan Deb Roy, “Quinine, mosquitoes, and empire: Reassembling malaria in British India, 1890-1910,” South Asian History and Culture 4, 1 (2013): 65-86. For more information on African inoculation practices, see Eugenia W. Herbert, “Smallpox Inoculation in Africa,” The Journal of African History 16, 4 (1975): 539-559; Pascal James and Gavin H. Imperato, “Smallpox Inoculation (Variolation) in East Africa with Special Reference to the Practice Among the Boran and Gabra of Northern Kenya,” J Community Health 39 (2014): 1053-1062. Inoculation here means inoculation with the smallpox virus, while vaccination means inoculation with cowpox. Vaccine farms functioned more as lymph-producing labs than popularly-known agricultural farms. Cows were stabled in one section of the building, where scientists and lay assistants injected the cows with pox material. After the cows produced pustules, scientists placed each cow on a table, took the pustules off the cow, and preserved these pustules as lymph in preservation media like glycerine, most widely used, or lanoline. Heberden, “Amateur Vaccination,” South African Medical Journal (December 1894): 216. By “government,” I presume the record means British-manufactured vaccine lymph supplied to the Australian government, which supplied its doctors. There is no record of a publicly-owned vaccine farm in Australia at this time. Victoria: Parliamentary Debates, Vol. 55 (Melbourne: Robert S. Brain, 1887):1683. Colonial Secretary of Antigua to Crown Agents, 25 March 1901, “Africa: Vaccine Supply to the Protectorates, 1901-1903,” National Archives, Kew. Cape of Good Hope: Reports on the Public Health for the Year 1893, including reports of the district surgeons and local authorities (Cape Town: W.A. Richards and Sons, 1894), xlvii. J.W. Mathews, “A Visit to the New York Hospital for the Isolation of Infectious Diseases,” SAMJ (March 1894): 224. “Government of India Home Department Sanitary Commission: [Copy] Letter to His Majesty’s Secretary of State for India,” 1902, National Archives, Kew, 5. For further information on smallpox vaccination in imperial India, see Sanjoy Bhattacharya, Mark Harrison, and Michael Worboys. Fractured States: Smallpox, Public Health and Vaccination Policy in British India, 1800-1947 (New Delhi: Longman, 2005). Recent research has deconstructed metropole-colony diffusion theories pushed by scholars such as George Basalla, moving towards a decentered Empire in which colonies influenced both British culture and society, and other colonies through imperial bridgeheads and networks. Alan Lester thoroughly outlined this debate in “Imperial Circuits and Networks: Geographies of the British Empire,” History Compass 4, 1 (2006): 124-141. For more detailed examples, see Carl Bridge and Kent Fedorowich, ed., The British World: Diaspora, Culture, and Identity (London: Frank Class, 2003); Antoinette Burton, The Trouble with Empire: Challenges to Modern Imperialism. (Oxford: Oxford University Press, 2015); John Darwin, “Imperialism and the Victorians: The Dynamics of Territorial Expansion,” The English Historical Review 112, 447 (June 1, 1997): 614-642. Reblogged this on DailyHistory.org Blog.